Chicken breasts are a convenient way to get the great taste of a smoked chicken without taking the time to prep and cook a whole chicken. This recipe typically cooks in about half the time it takes to cook a whole chicken. It is also a great alternative when cooking for a crowd who doesn't like dark meat. If you do not want to purchase all of the individual ingredients for this recipe, you can always use what rub ingredients you already have or purchase a chicken rub from your favorite barbecue restaurant or your local supermarket. The key to this recipe is the combination of the smoky flavor of the wood chips and the barbecue sauce. 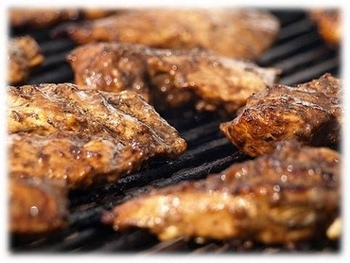 Soak your wood chips in water and light your smoker in advance of prepping your chicken. This is especially important if you are using a charcoal smoker, because your charcoal will take about 30 minutes to turn glowing white before it is ready for cooking. Once your charcoal is lit, put your wood chips in a foil pouch with holes punched in the top or in a smoker box to allow the smoke to escape out the top. Mix all of the chicken seasonings together in a mixing bowl along with enough barbecue sauce to coat all of your chicken breasts coat all of the chicken breasts. Place the chicken breasts on your smoker and shut your grill lid. Cook for an hour and 15 minutes. Check your smoked chicken breasts to make sure the temperature is still holding at about 250 degrees. Flip the chicken breasts and close the lid again. After 30 minutes, check the internal temperature of the chicken with a meat thermometer. You are looking for a temperature of 160 degrees before you can pull them off the smoker. Serve your smoked chicken breasts with a side of barbecue sauce for dipping. This recipe typically takes about 2 to 2 1/2 hours when the chicken breast reaches an internal temperature of 160 degrees Fahrenheit. This may seem like a lot of time to cook dinner, but this is relatively short compared to cooking a whole chicken. Also, this recipe might cook faster depending on the temperature of your smoker.